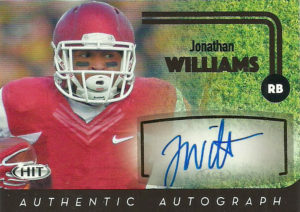 Jonathan Williams played runninback for the Arkansas Razorbacks from 2012 to 2014. Every year Jonathan’s numbers improved culminating in his junior year in which he had 211 carries for 1190 yards and 12 TDs. After sitting out his entire senior year due to a foot injury, Williams was selected in the 5th round of the 2016 NFL Draft. He’d play sparingly over the course of his rookie season rushing for 94 yards, and scoring his first touchdown against the New England Patriots. Jonathan was cut in 2017, and quickly found a home with the Broncos on their practice squad. Soon thereafter the New Orleans Saints stepped in, and signed Jonathan to a two year deal off of Denver’s practice squad. Currently, Jonathan is a member of the Indianapolis Colts.